“I had 13 hockey teams-all kids. They came to me and asked, What can we do? I told them you can't be a hockey player without a sweater. How many do you want - twenty-five! So I rigged out 13 teams that it never cost their parents a five-cent piece. There were some good hockey players turned out-but it wasn't me who turned them out, actually. It was them, on their own steam." This is a quote from an interview that Grande Prairie Historian, Isabel Campbell obtained from Johnny Macdonald in 1984 before his death the following year. (Herald Tribune, June, 26, 1984). One of the teams that was outfitted is shown above capturing a faint smile from Johnny (the adult in the picture) whose typically stern and serious demeanor bore witness to his stone cold determination to make it possible for any kid who was interested to play hockey and proudly wear a jersey that advertised the Elks, a men’s service club. The Stagettes, a women’s service club was another group that responded to Johnny’s request for support and sponsored a team. Johnny’s comments and the above picture snapped in 1949 reflected the status of Grande Prairie minor hockey in 1949 as Canada was recovering from WW11. A number of kids that played on Johnny’s teams left Grande Prairie to play major junior and college hockey and from there went on to play professionally. Johnny MacMillan, Duke Edmundson and Ken Solheim made it to the NHL and a number of local boys had successful careers in the minors including, Pete Wright, Galen Head and Doug Rigler. It is worth noting that a skilled contingent excelled in Europe during the fifties. Stan Neufeld was recently contacted by Renato Pedrini now living in Spain. He raved about the skills of young men from Grande Prairie who played in Europe. He pointed out that they played a major role in the development of hockey in England, Scotland and Switzerland beginning in WW11 (see Max Henning: Tales of Armed and Unarmed Combat) and later during the fifties. Pedrini, attending high school in Switzerland at the time remembers the famous Paisley Pirates line that included Ken Head (GP Hockey Legend) and Bob Kelley. “When I was a schoolboy”, reports Pedrini, “Bob Kelly was my idol. Competent old timers in Davos, Switzerland told me that he was considered one of the best stick handlers in Europe in the fifties. In recognition of the contribution of Canadian hockey players in Europe at this time Pedrini has organized the “Bob Kelly Golf Tournament” held annually in Scotland, England, Switzerland and here in Canada. Pete Wright was an All-Star defenseman with the Earl’s Court Rangers. All of these players came through the minor ranks of teams that Johnny organized and they honed their skills on Johnny’s ice. Johnny arrived in Grande Prairie with his parents in 1913. “I played with men in those years, stated Johnny, although I was much younger than the rest of them.” Upon arriving in his new home, Johnny was recruited to play point (defense) in a match against Saskatoon Lake played on a patch of lake ice that was cleared of snow for the contest. Lake Saskatoon won the game 3 – 1. Years later when Johnny was Manager of the Wapiti Arena a hockey fan asked if he remembered the time Herman Trelle, playing rover for Lake Saskatoon pitch forked him into a snow bank. “Of course I replied, but where were you?” “I was a seven year old Lake Saskatoon fan standing in the snow bank where he buried you,” said Henry Monkman. Bill Innes was Grande Prairie’s lone fan at the game. He had ridden horse back for twenty miles (3 – 4 hours one way) to cheer for the visiting team. (Herald Tribune, June 26, 1984.) Instead of playing hockey as an adult Johnny turned his attention to managing the local rink, coaching and teaching both hockey and figure skating. The Wapiti Arena opened its doors in 1919; the only covered arena in the Peace country at that time. Exactly when Johnny became manager of the rink and began coaching and outfitting kids to play hockey is undetermined. It was likely in the late 1930’s prior to the 1940 renovation of the Wapiti Arena. The renovation, supervised by Johnny expanded the seating capacity of the arena to 1000, the largest indoor gathering place in town. He held a full time job as Manager of Frontier Lumber but hockey was his first love. What he was paid to manage the rink and how his responsibilities were determined is unknown. What seems clear is that all of his waking hours were divided between the Frontier Lumber Company and the rink. In the fifties, under the leadership of Hockey Legend Roy Peterson the outdoor rinks on the Bear Creek Flats were constructed introducing a new era in Grande Prairie’s minor hockey history. Roy tacked a sign up sheet on his back door and 200 kids signed up – the fee was $1.00 per year. However neither the lack of a “buck” nor equipment was a deterrent. Roy made it clear that anyone who was interested in hockey could play. The program in its entirety was staffed by volunteers who ran the program, maintained the facilities, coached and refereed the games. “The rinks were busy 24/7,” reports Stan Neufeld who was among the legion of kids who learned their hockey skills on the Bear Creek Flats. However he goes on to say, “We felt like we had hit the big time when we played in a tournament or against an out of town team in the Memorial Arena where the Senior Athletics coached by Johnny competed.” Stan was one the 200 kids who scribbled his name on Roy’s list in 1960. Prior to the fifties there was no organized junior hockey program in Grande Prairie but under Bob Neufeld’s leadership a High School Hockey League served as a steppingstone to the Knights of Columbus League (KCL – 1963 – 1976). KCL games were mostly played in the Memorial Arena. Paul Keroak was the first President of the KCL and later Bob Poirier took over as Commissioner. The KCL enabled older kids to play hockey filling the gap between minor and senior teams. Stan reports, “During this period All-Star Juvenile tournament teams were organized and competed with teams elsewhere in the Peace country and beyond. Stars of this period included Dave Emerson and Barry Edgar.” Among the coaches that Stan remembers are Pete Wright, Charlie Turner Bernie Rempel and Tommy Hamilton. The KCL paved the way for junior hockey that included the Junior Athletics first coached by Pete Wright and succeeded by Don Swanston and Max Henning. Teams that followed were the North Stars and the Chiefs who played in the Rocky Mountain Junior Hockey League from 1991 – 1994. The highly successful Storm franchise that plays in the Alberta Junior Hockey League was organized in1996. Johnny was minimally involved with the development of Junior hockey but his dedication to make it possible that as many kids as possible had a chance to play established a platform for various successful Junior ventures identified above. The above snap shots represent the foundation and evolution of today’s thriving Minor Hockey program in Grande Prairie. According to the 2011 census, Grande Prairie’s population was 55,032, Alberta’s seventh largest city. Today 918 players are registered on 56 teams. It is a sophisticated program made possible with the support of 327 volunteers serving as coaches, assistants, trainers, and managers all coordinated by Executive Director, Lorna LeBlanc, one staff member and an operating budget of $14,000.00. Coaching in Johnny’s era was mostly organizing the team, supervising line changes, encouraging the kids and managing behaviour. Minor hockey today includes the instruction and development of individual and team skills at a level unknown in Johnny’s era when players, for the most part learned their skills from one another or as Johnny stated “ It wasn't me who turned them out, actually. It was them, on their own steam." Unfortunately, unlike minor hockey in its beginnings many young people today are unable to play hockey due to expenses involving the cost of equipment, registration fees and in some cases travel to tournaments. Depending on the level of play, team budgets range from $2,000.00 to $140,000.00. These budgets are supported by a combination of fund raising and expenses that fall on the family. It’s a substantial business. During WW11 and before, most kids of the Wapiti and Memorial Arena eras learned to skate and practice hockey maneuvers on outdoor rinks, lakes and ponds. However, the Arenas were instrumental in establishing the important role of hockey in the community. The rinks were centrally located in the shadow of Grande Prairie’s highest landmark, the water tower and beside the Ice House. On a cold Saturday night during the winter after stores closed at 9:30 pm hockey was the only game in town. For free admission to a game Johnny equipped a young hockey enthusiast with a sandwich board and a cowbell. The “town crier” would roam the streets on busy Richmond Avenue advertising the game. Most often the arenas were crammed to the rafters – standing room only. Cars were scarce prior to and during the war. None-the-less the town’s population swelled to overflowing on a Saturday. Farmers tethered their teams to hitching posts behind Richmond Avenue or “parked” them at the Livery Barn a block from Main Street. In the Livery Barn horses were sheltered under roof and fed and saddle ponies or horse drawn rigs could be rented – precursors to Hertz, Avis, National and Budget Rental Cars. Many farmers and their families remained in town after the stores closed to watch a Saturday night game featuring the senior Red Devils coached by Johnny and long after midnight many tired “teamsters” relied on faithful horses to find their way home. The source of Johnny’s interest in figure skating is unknown but he skated long after he played hockey frequently demonstrating his skills during public skating sessions. Calvin Balisky was a Bear Lake farm boy attending school in Grande Prairie. He was a fine all around athlete and a good hockey player. One night at a public skating session Johnny captured Calvin’s interest and on hockey skates he attempted to copy Johnny’s moves. Calvin’s efforts were infectious and before too long everyone on the ice was practicing jumps, spins and flat irons in solo and in pairs. Thereafter, public skating sessions featured many “would be” figure skaters. Periodically throughout the winter Johnny and his figure skating protégés organized public performances. For example, on February 18, 1946 the Herald Tribune headlined, “Comedy Ice Carnival Drew Record Houses On Both Evenings. All in all it was one of the best carnivals ever seen in this town.” Johnny spread a wide net. All good things come to an end and in 1948 the Wapiti Arena was condemned and planning immediately began for the design and building of a new arena under the leadership of Johnny. For the next three years only open-air ice was available for minor hockey. Organized hockey languished during that period but in 1951 the Memorial Arena, dedicated to men and women who represented Canada in WW11, opened its doors and hockey resumed as an important element in the town’s recreational, social, cultural and economic structure. Although hockey activities were interrupted from the closure of the Wapiti Arena to the advent of the Memorial Arena veterans returning from WW11 quickly revived interest in the game and with the completion of the new arena Grande Prairie hockey regained its former glory. It was Grande Prairie Hockey’s Golden Age. The war was over, the boys were home and hockey provided an important link to their pre-war youth. Hockey was affordable for anyone interested, players took to the ice for the love of the game, ancillary services such as organizing, coaching, managing and even constructing and maintaining facilities was accomplished almost completely by volunteers. Once again the arena, now accommodating 3,000 fans was filled to capacity on Saturday nights when the Red Devils, later called the Grande Prairie Athletics took to the ice to compete in the Northern Wheat Belt League and at other times the structure rang with the sound of kids learning to stick handle and pass the puck. Keep in mind that organizing events and activities was accomplished without computers that were beyond imagining and it was some time after the war that phones were commonplace in town. Newspapers and the radio were important but communication was mostly word of mouth. Johnny continued to manage the new rink and coach both hockey and figure skating. He was involved at every age level of the game, beginners, juniors and the senior team. 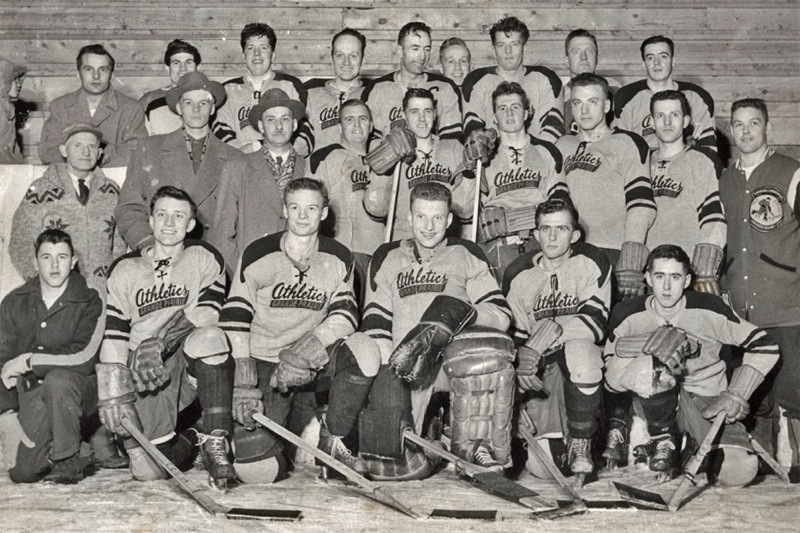 A photograph taken in 1954-55 (above), shows Johnny as co- coach of the Grande Prairie Athletics along with Bob Neufeld; a duo that brought together the old and the new. The Memorial Arena featured heated dressing rooms with commodes - no more “honey pails” and frozen underwear to struggle into before a game. There was a gondola, an office for Hockey Legend Fran Tanner where he announced games that were heard on radios throughout the Peace. Sports Talk, was a Herald Tribune column written by Orm Schultz of the Advertising Dept. and John Lynn, a local businessman and volunteer Sports Reporter. Orm and John provided full print coverage of hockey and its local heroes. They were to the newspaper what Fran was to the radio. Like the Wapiti Arena the Memorial Arena served the community for over thirty years but in 1982 City Council declared the arena unsafe. Mrs. Macdonald reported that her husband Johnny was heart broken when it was dismantled. The two arenas witnessed over sixty years of Grande Prairie history. They were a focal point in the town for recreation and much more. Under their umbrellas heroes were made and legends were born. Johnny was their keeper and guardian. Because of his support for and dedication to hockey, Johnny was recognized as Mr. Hockey throughout the Peace country. Before the era of Zambonis and artificial ice he was noted for creating superior ice surfaces using a fifty-gallon drum mounted on a sleigh. The drum was filled with hot water that was released into a pipe with holes at regular intervals distributed the water onto the ice through burlap fabric as Johnny carefully pulled the sled from one end of the rink to the other. However, it was risky to depend on natural conditions for ice and through efforts piloted by Roy Borstad, infrastructure for artificial ice was installed during the era of the Memorial Arena. However, Johnny and his trainees continued to use their tried and true hand pulled ice making equipment and several later manual inventions to make ice until the town could afford its first Zamboni. It was in the mid sixties after thirty years of late nights managing rinks, coaching all levels of hockey and figure skating and serving as manager of Frontier Lumber Johnny turned over his responsibilities to full time employees and a younger generation of volunteers. His retirement marked the end of a remarkable era. It is reported that after he retired for as long as his health allowed he never missed a hockey game. Outdoor rinks still exist in the winter time but minor hockey is played under roof at eight different venues including Coke North, Coke South, Dave Barr, Canada Games, two facilities called the County Sportsplex, Clairmont and Grovedale. Johnny established hockey as a small town tradition that is remarkable by any standard in Canada. It is unfortunate that he was not around in 1984 to see Mayor and GP Hockey Legend Oscar Blais re-name the Recplex Arena as the Johnny Macdonald Arena. In 2004 he was inducted as a Grande Prairie Hockey Legend in the Builder category.